Access this plethora of infinite geometric series worksheets tailor-made for students of high-school. 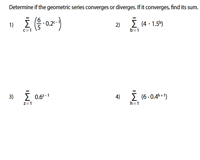 The worksheets cover the major skills like determining the nature of the series (convergence or divergence), evaluating the sums of the infinite geometric series, summation notation, finding the first term and common ratio and more. Observe each infinite geometric series provided and jot down the 'r' value. The series converges when r lies between -1 and 1, or it diverges. Find the sum of the geometric series with the first term and common ratio using the relevant formula. 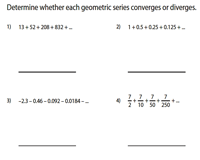 Record 'No Sum' if the series diverges. 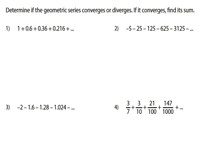 Obtain 'a' and 'r' from the geometric series provided. Find the sums of the infinite series using the formula. 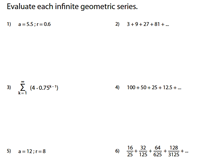 Find the first term and common ratio to solve this series of Type 3 worksheets that involve infinite geometric series in summation notation (sigma). These mixed worksheets comprise of blend of problems from Type 1, 2 and 3. 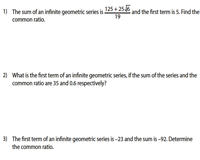 Determine the sum of each infinite geometric series. This set of worksheets encompasses 5 questions per page in the word format. The sum of the infinite geometric series is given. 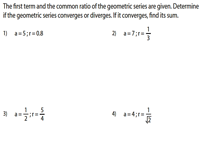 Find the missing parameters, the first term (a) or common ratio (r).